100% pure, cold-pressed and organic, this formulation provides the unmitigated power of a natural wonder: rose hip seed oil. Rich in linoleic (omega 6) and linolenic (omega 3) acids, alongside pro-vitamin A, the oil targets signs of photo-ageing (premature ageing caused by repeated exposure to ultraviolet radiation) and boosts the skin’s overall health for a radiant result. 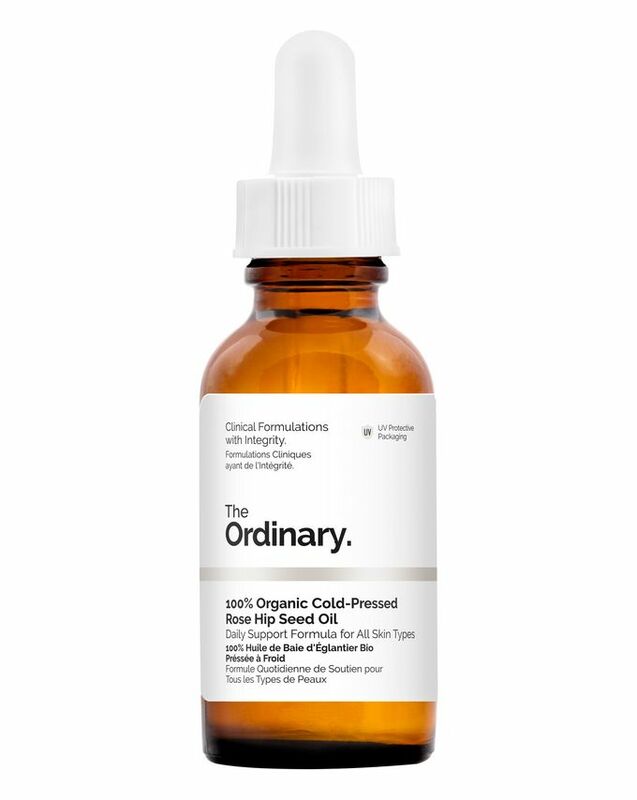 Providing a pure, unmitigated natural skin saviour, The Ordinary’s 100% Organic Cold-Pressed Rose Hip Seed Oil is brimming with vitamins, antioxidants and essential fatty acids, which are known to hydrate and promote a smooth, even complexion. To ensure that no one of these is compromised, this formulation is cold-pressed, as any extraction process involving heat causes it to degrade. Rose hip seed oil’s rich quantity of linoleic (omega 6), linolenic (omega 3) acids and pro-vitamin A allow it to target signs of photo-ageing – premature ageing of caused by repeated exposure to ultraviolet radiation. It is also known to correct dark spots, hydrate dry, itchy skin and even reduce scars and fine lines by encouraging cellular regeneration. The Ordinary’s formulation is completely unrefined, leaving it with a natural scent, which is a testament to its purity not (as it may be mistaken for) its rancidity. The first time I used this on my face I was very pleasantly surprised the next morning as the crevasses on the face were noticeably improved. As it was pilling quite a bit I put it on by itself the second time and the next morning I thought there was something wrong with my eyes - even more improvement. It's very good stuff. I am contemplating putting it on all over. Gets rid of texture and makes your skin look so plump, on my third bottle. Got my sister hooked too. I bought this a month ago, I’d really recommend it to everyone who wants glowy skin. The price is reasonably cheap but the quality of product is mind-blowing.You can see noticeable good change on skin .Thanks Ordinary. This is ok for the price point but not one of my faves. It’s a bog standard oil. It’s not hydrating enough for my skin and I don’t find it absorbs as nicely as other facial oils I’ve used. Did nothing for me - but it is cheap! I'm just obsessed with oil, second time I'm ordering it. I used this oil it's very effective. Its a great natural product. However, you need to understand about the oils to use it promptly. Very prompt delivery and great quality. No difference from more expensive brands. Can’t get enough of this! Hormonal acne prone sensitive skin with texture & scaring. This is magic in a bottle. Must have for me! After seeing this in Thaatayla’s videos on YouTube I really wanted to try this and I haven’t been disappointed. I’m not sure if this product is attributing to it but my acne scars are a lot less prominent and my skin feels hydrated in the morning after applying the night before! I’ve begun using this nightly alongside Buffet and it has made a real difference to my skin. From the outset it looked brighter and plumper with a more even tone - even lasting on nights I forget to apply. I use it with a jade roller and have received compliments on my skin recently. It’s lightweight and fantastic value. 用起來非常棒平價 ** Very good to use. The oil feels really nice on the skin. The smell, in my opinion, is not strong. I use it in the evening and it makes my skin radiant and fresh. I wouldn't recommend using it under makeup or in the morning because it leaves an oily film on the skin. Did not work on me at all. It's too thick. I have very dry, eczema prone skin. I have struggled for ages to find something that make my face feel moisturised and something to help me get my skin feeling plump and soft and I have finally found it. I apply this oil every night and morning, for oily skin every night would probably be best but as my skin is so dry I apply twice a day and it really has helped. My skin is less red and angry. My makeup applies amazingly. Obviously, I still get spots now and then but since using this it defiantly has reduced them. I could not recommend this stuff enough!! Used by my wife, she is very satisfied. Recommended. I bought this oil about three weeks ago as I read that Rosehip oil helps to fade scars. It’s probably too early to say if my dark marks are getting lighter, but I have noticed that my skin feels a lot smoother. It’s a good lightweight oil that soaks nicely into the skin and leaves your face feeling moisturised. I was worried about it being greasy and causing a breakout but it’s really helped as most products for acne prone skin tend to dry out my face so this helps putting the moisture back. I have been using this now for about 7 months, having dark discoloration on the chin and around the forehead, this has helped clear it up not 100% but the skin has definitely lighter to the point no one can notice. Before I was embarrassed to walk out without covering my dark skin patches and having used all different facials expensive creams to the point even visited a dermatologist nothing worked until I read up on this oil and started to use. Definitely on repeat order. I adore this oil, it makes my skin soft, clear and minimises my pores. I have tried a few oils and my skin reacted badly! This oil has caused no reaction. My skin is soft and supple and my spots have reduced dramatically- I use it with the ordinary niancinamide. I would say I need extra moisturiser. Definitely worth the money. My skin is in such a better place since I'm using this oil. Definitely gonna buy again. I bought this product because it was the cheapest in the market. The morning after I used it for the first time, the pores had opened and white stuff started coming out of them (dirt as I read on Google). I thought it was a good thing and continued to experiment. Now it makes my face look hydrated and smooth in the mornings. I really like putting on this product in the night time after my skincare routine. My skin feels soft and hydrated in the morning. I blame it on the oil. Amazing product. I mix it with my moisturiser for day and use ‘neat’ at night. Simply gorgeous, skin more hydrated and smoother. Doesn’t cause breakouts and helps skin look clearer. It is such an amazing moisturizer and also it has made my skin better and clear the best thing is people notice it, I did not get breakouts after using this oil, I am even using it in summer, My skin type is a combination, dry from the cheeks. It is a thick oil but absorbs perfectly I also use it before makeup. The product as an oil is lovely especially to add to a moisturiser for an even glow during the day but when added on its own to my face at night I woke up with dry flaky patches? Not sure how an oil can dry skin out but this created more problems for me than solved. I found it takes a while for it to work on my skin but definitely leaves my skin feeling smooth and soft. I still have some blemishes on my skin that it hasn't removed but hopefully, they will go when I continue to use it. It has however helped to get rid of my stubborn blackhead on my cheek. This oil is amazing, it really boosts your skin with the good stuff. It takes quite a while on my skin to be absorbed so I try to wash my face earlier in the evening and then put the oil afterwards so my skin has the time to "drink it" before going to bed so my pillowcase isn't too oily. And a little goes a long way. I already stocked up so if it goes out of stock I'm alright for a while. I like this oil very much. It is easily and quickly absorbed, I use it before my moisturiser at night, it doesn't make me break out at all and my skin feels so soft and plump in the morning. It leaves your skin so glowy and I use this all the time. This is a wonderful oil. My skin became clear, glowy and healthy! I love this oil. I absolutely love this product. I apply before bed (after cleansing and using Pixi Glow Tonic) and over the last few months, it has dramatically changed my skin. I have always had sensitive, dry, eczema prone skin with very dry flaky patches around the mouth and between my eyes. They have now completely disappeared. My skin feels soft and comfortable and looks lovely for the first time in years. Sometimes I even put a little bit on in the morning under foundation, but it is very heavy and oily so you can only use the tiniest bit in the day. Well packed delivered on time, have been using this product for some time now. Happy with the results. I bought this to upgrade my hydration game before I incorporate any acid into my routine. But low and behold, it fades my pigmentation too! It absorbs well into the skin. I even noticed less redness at the centre of my face. I use this a couple of times a week before going to bed as my only moisturiser and I love it. It doesn't always help to clear up my breakouts but I didn't expect it to be a miracle worker either. It's just a lovely, gentle oil that leaves my skin feeling happy, healthy and glowy. Great value for money too. Wow. This product was a game changer for me. Struggled with pigmentation for years and years and have cleared so much ever since stated to use this product. Love using it under foundation as well for a glowy appearance. Wow, this is super value gold product. I bought this help me to hydrate my skin and it worked very well. I love this oil. It leaves my skin feeling silky smooth and very radiant. I suffered from a very dry skin but this product completely got rid of the dryness. I am so impressed with "The Ordinary " brand as their products are miracles in a bottle. My skin is so dry I can use 3-4 layers of this stuff morning and night and still have a dry face within a couple of hours, but it still does a pretty good job, especially in use with the 100% squalene. Not the miracle I was hoping for, but I imagine it will be for those of you whose skin isn’t completely useless. Fantastic product and excellent quality oil. I was originally a sceptic about using oil but I find that rose hip seed oil works splendidly for an oily/acne-prone skin. It absorbs beautifully and has sped up the healing process of my PIH. Definitely a staple in my daily skincare regimen. I have tried EVERYTHING and I mean EVERYTHING to get rid of my oily skin. I've only been using this 2 nights and I have just finished my 9 hour shift and for the first time ever NO SHINE. I can't believe it! Usually, at this point, I would be able to grab a spoon and scoop the oil from my face to fry some eggs loooool. Best purchase of my life. Thank you!! Very good oil. Very light and definitely brighten up a skin over time. Need regular use. I haven’t used this brand as yet but I have been using the rosehip oil for a couple of years and swear by it. Definitely does everything it’s claimed. I will purchase this brand when my current bottle finishes and of course when this one becomes available again. The reason I’m reviewing as I noticed some people commenting on the smell of it - I had extensively researched this oil prior to buying it and most recommendations where that you store it in the fridge to stop it ‘going off’ and subsequently giving off the rancid smell. The first bottle I had was quite large and lasted me a year, there was still plenty product in the bottle but as it had a shelf life of a year, I just disposed of it but I can honestly say there wasn’t any smell from it. I purchased from a reputable company so I know it was the real deal. I hope this helps those who are remarking on the smell. Excited to try ‘The Ordinary’ brand, just one problem, there’s too much to choose from lol. Absolutely love the prices, I can see me building a collection of their products. Yes, I am a skincare junky. This is oil is such a good deal! It makes my skin soft and supple and gives a fantastic glow. The fact that it is organic is a big pro for me, and it makes the low price even more mind-blowing. Great for body care, too. I love this so much, I've had really persistent acne scars that kept building up and never left, meaning it looked like I always had a really bad breakout- but this has really helped reduce the pigmentation and got rid of some. I have oily skin and use this at night before my moisturiser and really hydrates and leaves my face all glowy. Love it. My skin is a combination and I’ve never had any problems until a breakout last July. Skin is still clearing and is taking forever so decided to try this due to all the good reviews. Face felt softer from first use, took about 2 weeks to notice any results for redness and blemishes. It’s really changed my skin and it’s so much clearer and the only thing that’s seemed to work. I do still have a few red patches but I haven’t had a single spot come up on my chin or cheeks since using. The redness has deffo gone down and skin feels a lot better it just took some time. I only use it at night after cleansing and don’t combine with any moisturiser as I feel it’s moisturising enough, it’s also helped with my dry lips! So all in all this is magic! Rosehip oil is literally LIFE!! I apply every night before bed & it keeps my skin healthy and glowing. If you have dry skin I recommend it 110 %. Best ‎£9 I've ever spent. I have never bought from The Ordinary before but I will definitely be looking at the products again. This oil is amazing I bought it as a nighttime hydration and my god does it work! Comes on so smoothly and moisturises the skin perfectly. I felt a difference after 1 use, my skin is very dry and this has changed my skin already after a weeks worth of use. O and the price is amazing! Will definitely be buying from The Ordinary again. I have dry/normal skin but also adult acne and I have tried a LOT of things to moisturize without making me break out. This is the holy grail. Not only did it completely take away the dryness but it healed and lightened some of my scarrings as well. Definitely will re-purchase. I bought this to help fade melasma hyper-pigmentation caused by HRT. It's taken 3-4 weeks but I'm now really starting to see a difference. I'm also noticing a reduction in the appearance of some very old pitted acne scars I've had since I was a teenager. I use 3 drops at night as the last step in my skincare routine (so on top of my moisturiser) and I mix one drop into my moisturiser in the morning. I really massage it into my skin. It's good stuff. Feels nice on the skin and leaves skin feeling smooth and soft. Not a great smell but it is nice and calming leaves skin less red. I must say, it is imperative for me to give my review of this product. A short story to help you better understand how what a saviour it is. my skin is oil/combination and visible pore. my skin is also acne prone, so at a time before sleeping I get terrified to feel that there is an acne coming out. I would apply this before I sleep. And next morning the acne has reduced. I also feel that with regular usage the texture of the skin is building smother. This is a great product, especially for the price. I use I before my moisturiser at night most days and have found it helps reduce the marks of previous spot scars and leaves my skin feeling hydrated. It sinks into the skin quickly rather than sitting on top. Excellent product! Why buy expensive oils when you can get this great oil for 9 pounds? I bought this at hoping it would improve the dry patches on my face and chest and noticed results from first usage. I usually leave this on overnight as I feel the oil is too thick for me to wear on my face day to day. Another thing to note is that I absolutely hate the smell of this oil, my mum think it's smells like old vegetable oil, I'm not usually too sensitive to scents but it could just be my personal presence of disliking the smell. Absolutely love this, does exactly what it says on the tin - I have even replaced my old daily moisturiser for this (I'll just have to get used to the smell haha). I ran out of this about a month ago and didn't think much of it, as I don't really like the feeling of it when I put it on (so oily!). But hot DAMN does my skin miss it!!! My skin is drier and I seem to have more blackheads somehow? Anyways I've learned my lesson and I'm re-ordering. Hope my skin will be happy with me. Just ordered my second bottle. Lovely night oil. Can't say if it reduces wrinkles as nothing short of a face-lift would get rid of mine. However, leaves skin soft and healthy looking and doesn't make my sensitive skin flare up. Brilliant skincare at a great price and Cult Beauty have full range with very speedy delivery. This is my second order and won’t be my last. This oil totally saved my skin after a pretty serious product reaction plus it smells absolutely divine and leaves my skin feeling silky smooth. A HG product for sure! Have been using this for a year now and it does wonders for both my winter and summer skin. It’s perfect under makeup and my face feels moisturised for hours. Soaks into skin easily and leaves no oily residue. I can’t compliment this product enough. Amazing rich oil that really soaks unto the skin and stays moisturized for ages, not greasy or perfumed 10/10...brilliant value will never spend a fortune on all the other over priced facial oils out there! The only hing that keeps my dry winter skin at bay. Love it. Gentle and non greasy on skin. Even good with foundation. Recommend. Love this oil! Even on the nights, I decided to skip it for another moisturizer, I find myself reaching for it afterwards anyway. It gives my skin a lovely glow in the morning and is one of the only products that has somewhat tamed my oily skin. I use it rare, usually after the AHA BHA peeling solution.I find that it's too "oily" for when I don't exfoliate.It's ok and I never had a breakout from it, but I am always scared I will, so I take care and apply just a bit. This product is good and does all that it promises to do, but it doesn't soak into the skin very well. I’ve been using this product for about a month now, and nothing has changed. My research on facial oils, proclaim that they should balance the natural oils on the face. It unfortunately didn’t help balance it out. I’ve made it worse by using this product. I hoped it would have worked but I feel it has made it worse. I am 15 and have developed more spots and acne than ever before. I love rosehip oil because it’s great for my dry skin, especially over the harsh winter weather. I use this oil as part of my night routine, and it makes my skin feel soft in the morning - like a baby’s bottom as one of my make up artist put it! What’s even better about this particular brand is that it is exactly the same as the high-end brands that I’ve used before, except this one don’t come with a big price tag! I am on my second bottle and know that I will be ordering this one again, and again. It is an amazing oil, really, it is dry and the skin absorbs it so easily. I have just purchased it for a second time. P.s. Combination skin speaking. Lovely oil, especially for winter lips. Use occasionally before bed and wake up with soft skin, use sparingly or it can sit on the skin and make your pillow a tad oily! This is such a gorgeous oil. It makes my skin glow. I have oily skin so I tend to use this every other night, interchanging with a lighter moisturiser. Otherwise, I get the odd spot. I use this with the glycolic acid and the Hyaluronic acid and Maxtryl (spelling?) oil. This combination has made my skin amazing and the perfect base for makeup. My skin is smooth and I just love this oil. I apply this sparingly in the evening after cleansing and when I wake in the morning my skin is so soft. I prefer it to heavy night creams. This oil makes my skin super soft and even, and my skin loves it. BUT one thing that can't be ignored is the awful fishy smell. I try to avoid using the oil in the morning as I could smell it all day when I did. Also a little bit too oily to use under make-up. Penetrates into the skin easily and heals skin. My dry patches no longer exist and my skin feels better. A few drops go a long way. Amazing product. I have very oily skin and I put this on every night after taking my makeup off. I did this for 3 weeks and saw a difference in how much my skin produced less oil. Such a good product to get for any skin type even very oily skin. I highly recommend. Amazing product! Best moisturiser ever. Non comedogenic! Wake up in the morning with plumped and hydrated face. Love it! It’s the best facial oil I’ve ever tried. Not the nicest smell, but I tried putting a drop of lavender oil which smells great with added benefits. I’ve been using this for a month along with a few other The Ordinary products and I have to say my skin is looking the best it ever has. This oil is perfect for my nighttime moisturiser as it’s so lovely and hydrating and feels very luxurious and hydrating. I will keep buying this. I have been using this with a few other Ordinary products to heal my hormonal acne and fade red scars. This oil is perfect for nighttime and I wake up with smooth skin. I have been using this for about a month now and it has been great with not causing me to break out like I normally do with oils. Very good product. Help to acne and red skin. This oil is truly amazing! Worth it - even for oily skin (applied at night) worked amazing for my little white bumps on the chin and also acne marks! I have cystic acne, and I bought this product cause a lot of people were happy about the results it gives, so I decided to try. Unfortunately it broke me out really really bad. I tried again after 8 days, and the result was the same. If you have acne prone skin I suggest you to test it in a small area cause it can be very irritating. I use this as often as needed at nighttime if my skin is feeling at all dry. Skin feels hydrated and instantly softer. Great price for a product that makes my skin feel plump, soft and glowy. Added to my wishlist for future purchases. Very nice for before going to sleep, skin feels amazing in the morning. This oil is easily absorbed and makes my skin soft with improved pigmentation. What I don't like is that it stains my clothes (nightwear) and my pillowcases. Took me a while to work out what was causing this staining. Don't know if I'm going to continue using it. I bought this to help with dry patches and it has worked pretty well. Absorbs fairly quickly for an oil, so it's nice for morning use and on dry/textured patches just before applying foundation. I don't find it hydrating enough to use it at night though as my skin is pretty dry, so for that I use squalene. Works for all skin types, super value for money, handy dropper pipette, what’s not to love? Just drop some of this into your palm, warm it up in your hands and press into your face, neck, decolletage and anywhere else. Not greasy at all. Hands down the best oil I have used! This truly is a miracle oil! It has helped my skin so much! I’ve had breakouts over the past few years and I’ve tried so many products! This is now one of my essential steps in my night time routine! Absolutely love this product! Thank you Cult for stocking this! For the price, it's a really great product. It's a little heavy and sticky for my liking, and I don't love the smell. However, works great used over a retinol product at night, doesn't cause me any breakouts and I have quite sensitive skin. Would absolutely recommend, if your skin will be ok with a slightly heavier oil. If money is no object, the Chantecaille Rose Oil is absolutely beautiful. Was on a 3-week bender and didn’t properly sleep for any of it, however, applied this on my face every night before bed and woke up looking fresh as a daisy. Incredible. I’ve got a really sensitive skin with redness in my cheeks at times. After using a well-known brand of facial wipes today my skin was left angry, bumpy and red - cue this absolute lifesaver! A few drops and my skin has calmed down amazingly and is now lovely and soft with zero redness. I purchased this as one of my favourite YouTubers raved about it for fading hyperpigmentation left behind by acne. I was dubious at first because my combination skin is still very acne prone and I was scared this would make me break out. How wrong I was - This oil is a miracle in a bottle! I've been using it religiously for about a month now and it has faded the redness on my face so much. I also used to get spots on the tops of my arms which left behind red/purple marks, but they have almost totally faded thanks to rose hip oil! And the best part - it doesn't make me break out AT ALL. Could not be happier with the results from using this and it will continue to be a staple in my skincare regime for a long long time! Amazing. Great for sensitive skin. I’ve been using this for 8 months now. It cleared up my acne and small bumps only face. Skin super hydrated next morning and looking fresh! I apply the oil at night as I was recommended and in the morning my skin feels really soft, supple and hydrated. Although I have an oily T-zone and the rest of my face is dry plus sensitive, this oil did not break me out. It absorbs quickly, does not leave the skin feeling sticky/oily and the smell does not linger after absorption. People that are concerned about a product's smell like me, in my opinion, should buy it as it is not a that strong plus as mentioned it does not linger! Also, I personally use it as the last step in my PM skin regimen on a daily basis. I had quite a lot of hormonal acne scars which I just couldn't shift. After using this for two weeks in my night time skin care routine they have almost all gone. I'm confident they will all have disappeared in the next few weeks. Sinks into the skin nicely and doesn't leave it feeling greasy. Highly recommended. I have acne prone skin and wanted something that wouldn't make it worse and this does the job!! skin feels plump and not greasy, I use vitamin c cream over the top and its the perfect combo. For £9 you really can't go wrong. Haven't noticed any improvement in scarring, would suggest acid exfoliators for that (unless you have sensitive skin). I've wanted to try facial oils for a while now but have never known where/what to look for until my friend recommended this to me. My skin type is dry/sensitive so I needed something that was moisturising but wasn't going to cause irritation and honestly, this hits the nail on the head. I don't think the smell is as bad as other reviews make it out to be. I use this every night after I've taken my makeup off and used toner and it makes my skin feel so soft in the morning! After the first few days of using it, I noticed a considerable difference in the brightness of my skin and the pigmentation along my jawline had gone downloads. I recommend this so much and am so glad I bought it! This is now a staple in my PM routine. I have a mixed skin type that goes dryer in winter and it saved my skin from going all crazy. Now I wae up with smooth and moistrurised skin that glows. Too bad there often is a waitlist for this oil. I absolutely love this oil! Its changed my skin and for the better. I have oily skin and after watching Nikkia Joy on YouTube rave about this product I had to buy it, and I wasn't disappointed. I use this oil a few times a week, after I've cleansed and toned I pop a couple of drops into my hands and press it into my skin. My skin has gone from very oily to barely oily in just a few weeks. My skin type is combination-dry and I have cystic acne on my cheeks - the ones I had (regretfully) picked at have given me red acne marks. I use this nightly and over the course of 2 weeks not only has it reduced my cystic acne to only a small amount, the scars have almost completely gone, rosehip oil is such a holy grail for me now! This product is amazing! I have combination skin that is blemish prone, I suffered from severe acne on my cheeks and chin which went but left behind red marks and scarring, so when I saw this product I was intrigued to try it out and oh my gosh, it is one of the best treatments for bright red scarring that I have tried and it is super hydrating on my skin when my skin is more on the dry side. I would 100% recommend this oil product to anyone! Perfect oil to achieve flawless skin! Rosehip oil is my holy grail product for my face! I used to use a different brand which was a lot more pricey and The Ordinary Rosehip oil is so reasonable and a little goes a long way. I cleanse, tone, apply serum, moisturiser and then the rosehip face oil. I also use The Vitamin C Ordinary moisturiser. I have a very small amount of pigmentation which I’m very insecure about and since using rosehip oil this has severely reduced and my overall skin tone is a lot more slowly and clears which is why I’ll always use this. I also dab a tiny amount under my eyes which has helped reduced any tiny fine lines. Great for darker skin tones! I must admit that I was a little bit sceptical before ordering it.... But the price was attractive and Cult Beauty told on their Instagram Stories that it works wonders on darker skin tones who have dark spots/hyperpigmentation. They were right ! The first day, I noticed in the morning how soft, moisturized & shiny my skin was ! I was really impressed ! I love the fact that I just have to use too much product : three drop only (forehead and cheeks). Believe that enough to apply in your entire face ! I was also a little bit afraid that my skin begins to be "darker" because this is what some woman with the same complexion as mine experienced when they use certain products. But my skin stills the same ! My dark spot started to disappear. I waited almost 3 weeks before posting this review because I wanted to make sure that it will not cause me breakout or something else. I'm really satisfied and I really recommend it! Such a calming, nourishing product. I am so happy with it! It feels like a much more luxurious brand but without the price tag. I'm telling everybody about this miracle oil. I mix couple drops of oil with my overnight serum. Results are amazing! In the morning my skin looks soft, hydrated. I have a oily acne prone skin, and this oil absorbs really quickly to my skin. I've just applied it once yesterday night for 2-3 drops. And guess what? My dark spots on my face had disappeared today morning! It is a good value for money and also a good product to try it out for oily skin type person. I'll definitely purchase it again for my next order. I have fairly oily skin so I use this sparingly, but when I do it's miraculous. In the winter I sometimes get dry patches, and sometimes I have small areas where my skin peels from acne. When that happens I use this as the last step in my skincare routine before bed, on top of my serum. By morning the issue is totally gone! This is definitely not a daytime product, at least not for oily skin, but it's a must-have nonetheless. I decided to try this because of the hype. I kind of did not like this oil in the beginning, but after a week of use, I just loved it. It is amazing. It made my skin look fresh and amazing in the morning. Will definitely repurchase. I’m 45 and decided to give this range a try. WOW! My skin has never looked better. This oil leaves my skin silky soft and very smooth. It seems to make my skin flawless. I love it!